I am not sure how we are in the middle of week three, but we are. Following the craziness of Kids Week, my oldest was invited to back-to-back birthday late-night birthday parties on Saturday and Sunday—can anyone spell exhaustion?—which gave me some quality time with my youngest son. One-on-one time is all too precious. To my youngest, these days are sacred. We call them “special days.” Our trip to the pool was a blast. He dove for his shark torpedo, flew down the water slide multiple times (Daddy did too), and we played “You Can’t Catch Me” in the shallow end.” His giggles were contagious! Adorable. Finally, going home he snuggled close next to me, choosing HIS Superbook episode to watch. Not his strong-willed brother’s. These are just three snapshots, yet more should be included. I will spare you the full details but want to mention a snippet or two. An hour on the putting clock, trying to relive the days when I actually had time to golf … an enjoyable conversation with my good friend and colleague Jordan, taking in the controlled chaos of our Kids Week carnival … a late night conversation with my wife while lying in bed in the dark, just for the sake of talking … an enjoyable hour of coffee with my church friend Ryan, getting to know him on a deeper level and agreeing to share our testimonies next week at Camp CYOKAMO during some down time … priceless. All of these moments are invaluable, and I cannot wait to see the moments yet to come. If you were to create a photo album of your summer so far, what pictures would decorate the pages? The month of June is always a blur. Before you know it, you will be barbecuing on the 4th of July wondering where the days went. Refuse to take this summer for granted. 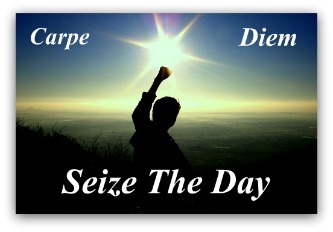 Live by the Latin sentiment “carpe diem.” Seize the day! Or as Robin Williams whispers over the shoulders of his students in Dead Poet’s Society, “Make your lives extraordinary.” James 4:14 says, “Yet you do not know what tomorrow will bring. What is your life? For you are a mist that appears for a little time and then vanishes.” Do not let that vapor puff away without leaving your mark on the summer of 2018. Savor every second of it. Journal/Accountability: Journal or talk with a trusted Christian friend about productive ways you could spend your summer. Bible story: Read the parable of the talents in Matthew 25:14-30. What talent do you have that you could polish this summer? How would God want you to spend that extra time off? Do not worry. Sometimes God will tell you it is okay to put your feet up on the couch for a half hour! Especially when your almost 42-year-old back is aching. Prayer: Lord, allow my summer to not be mine but instead Yours. Guide my every step to glorify You and all You stand for. Amen.